Screenshots of the game's early version. A Nightmare on Elm Street is a 1990 action-platformer released on the NES based on the horror film series of the same name. It was created by British-based developer Rare, known for games such as Donkey Kong 64 and the Banjo-Kazooie series, and published by LJN, who are infamous for releasing licensed games of very poor quality, especially on the NES. 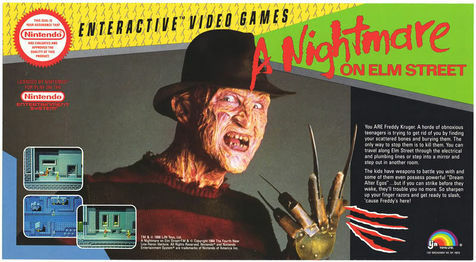 Gameplay focused around the teenage player character traveling to different locations in Elm Street to find and destroy Freddy Krueger's bones, the only method of permanently killing him, all while attempting to keep their sleep meter from depleting. When the bar is emptied, the character is transported to the Dream World where they can be openly attacked by Freddy and a multitude of super-powered enemies. To defend themselves, the character can collect tokens that can turn them into one of several special dream roles such as wizards and ninjas. Most if not all of the gameplay and story elements are directly lifted from the third movie in the series, The Dream Warriors. The game went through notable changes over the course of its development and, based on pre-release screenshots and publicity blurbs, was quite a different, more ambitious game. According to an advertisement featured in a 1988 issue of Nintendo Power, the original premise was that the player would control Freddy himself with the goal being to murder the teens attempting to find his bones. Freddy would be able to freely traverse the Dream World by warping through pipes, electrical outlets, and mirrors. After its initial announcement, the game's status was unknown until Fall 1989 when, in Nintendo Power #8, it was featured in an article about the NES Satellite peripheral. This time, the player character was simply an Elm Street teen. The article included two more screenshots from the prototype of what would become the title screen and one of Freddy fighting a group of kids, arguably still the player character by this point. Although LJN had apparently begun restructuring the game by 1989, the presence of these images, most of which include assets that would be used in the finished product such as the title screen, seem to imply that development had reached the point where the game's prototype build was mostly playable. It was delayed until 1990, which further implies retooling on Rare and LJN's part. No official explanation has been given for such a radical change, but considering Nintendo's reputation for producing family-friendly games and the financial failures contributed by earlier licensed horror games The Texas Chainsaw Massacre and Halloween on the Atari 2600 (many game stores refused to stock the former due to the fact that the killer was playable), it's entirely possible that either Nintendo or LJN ordered Rare to remake the game with a safer concept to avoid drawing controversy. Aside from the screenshots and articles listed, there is little other information on the original version of the game. While LJN has been defunct since 2000, it's possible that Rare or someone who worked on the game has a copy of the prototype. Blurb of the original concept featured on a poster in Nintendo Power #2. Ad featuring the three screenshots plus the original blurb. Original title screen and another screenshot.